Well, you know what happened last time: I fed the mogwai after midnight and all hell broke loose. You’d think I’d have learnt my lesson, but no. 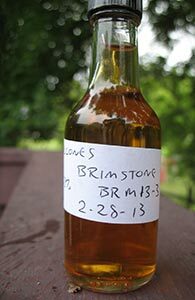 I’ve done a few blending experiments with my bottle of Brimstone that turned out surprisingly well (here and here). And I remained intrigued by the testimony of those who reported very different experiences with different batches. Then when I met Tim Read (and Sku) for lunch in Los Angeles last month Tim gave me a sample of a batch he deemed to be quite good and very different from mine as described in my review. So, here I am, about to give the Brimstone another try. Is my bottle from a bad batch (11-10)? Is the Brimstone palette of aromas and flavours just not for me? Let’s find out. Half of this was saved for later. 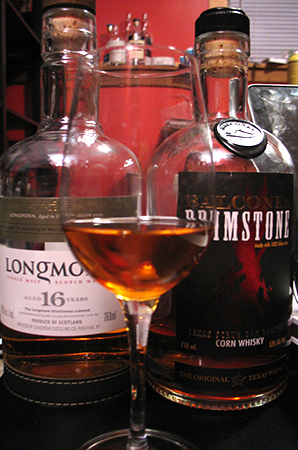 So, my first blending experiment with the Balcones Brimstone that I despise (Batch BRM 11-10) worked out really well. Mixing half an ounce of the Brimstone with one ounce of the Longmorn 16 took out the most offensive raw wood notes of the Brimstone and mellowed it out nicely. Of course, I’m not stopping there (and not just because my Longmorn 16 is much closer to the end than my Brimstone). The goal tonight is to add more citrus/acid fruit to the blend and also some phenols. As I type this I have a large’ish stack of papers to grade in less than 48 hours and a review to complete that was originally due to a journal seven months ago. Therefore, I am naturally engaged instead in messing around with the nastiest whisky I’ve had in recent memory: the Balcones Brimstone. 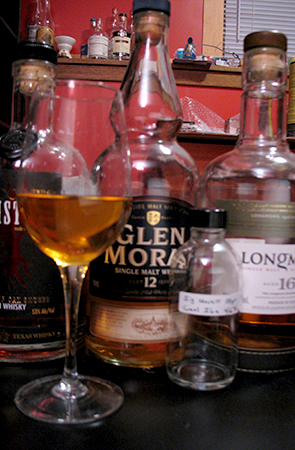 Tonight I blend it with an inoffensive and very different whisky: the Longmorn 16, a gentle Speysider from Scotland. Let’s see if anything good comes of it, and if a terrible whisky and a middling whisky can add up to a more palatable whole than the sum of their parts.. 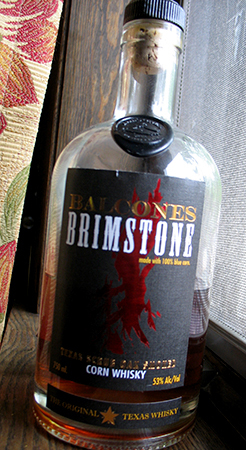 The Balcones Brimstone is perhaps the most disappointing whiskey I’ve had in a while. It’s a corn whiskey from Texas, smoked with Texas scrub oak, and many of the reviews I’d read noted aromas and flavours of barbecue smoke and bacon and barbecue sauce and so forth. As I love all of those things I expected to love this whiskey. I opened it for a tasting of American whiskies that I hosted for the group of friends I do monthly tastings for (see some pictures, and get details of how we do our tastings here). As most of us mostly drink whisky in the Scottish style I put together a tasting that included two highly acclaimed bourbons of different styles (Four Roses Small Batch Ltd. Edition 2012 and Pappy 15, Fall 2011 release) and two experimental whiskies (High West Campfire and the Balcones Brimstone). Based on reviews I’d planned to pour the Brimstone last. However, I opened the bottle two nights before the tasting (I don’t like to use freshly opened bottles for tastings) and really did not like it at all. Raw wood was all I got. I didn’t want the tasting to end on a low note, and so decided to begin with it and put a LOT of space and palate cleansers between it and the rest (we usually take three hours to drink one ounce each of four whiskies). I also hoped that two days of air might take the edge off.